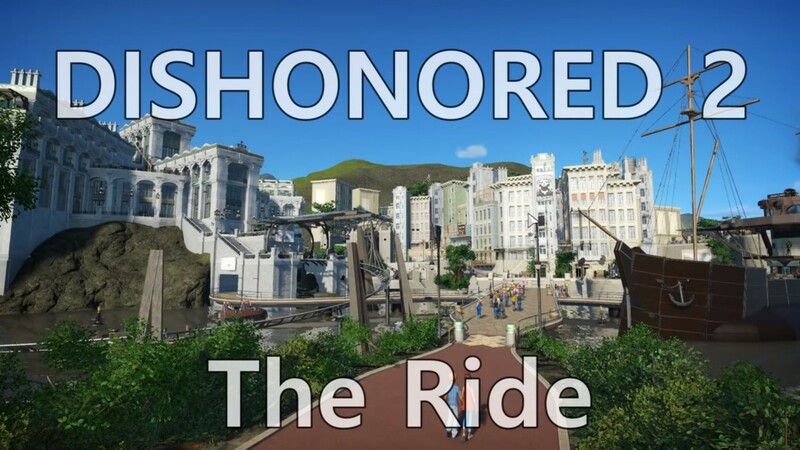 As strange as it may be to see the coastal city of Karnaca populated by balloon toting tourists, YouTuber Brad Hamilton has recreated the entire city from Dishonored 2 complete with banners dedicated to “her majesty, Delilah Kaldwin.” Most impressive of all, however, is the roller coaster that guides you throughout major story beats and locations in the game. Twisting and turning, the coaster takes riders past towering clockwork soldiers and Grand Serkonan Guards who shoot at you along the way as you pass through memorable locations like the Addermire Institue, the Clockwork Mansion, and The Palace. Along the way, riders help "defeat" Delilah's retainers, before finally dispelling the evil witch herself and sending her spirit back to the void. Throughout the video, Dishonored 2’s haunting main theme plays, which is just the icing on the cake. For the full video of Brad Hamilton's expansive project, you check it out below.